Can we all stop for a second and consider just how great Kickstarter is? From Mighty No. 9’s comically disastrous development to Undertale’s surprise success, it’s crazy to think that some of the most high-profile games of recent years only exist because fans finally have a direct way to fund the games they want to see. Tiny Barbarian DX is the latest in this series of crowdfunded games, and after 5 years of hard work it’s finally complete and available on Nintendo Switch – but will it fill you with determination, or just make you cry like an anime fan on prom night? Though it’s totally unrelated to the game itself, I’d feel remiss if I didn’t mention Tiny Barbarian’s gorgeous box art / home menu icon drawn by Susumu Matsushita, well known in Japan for his artistic contributions to the long-running Famitsu magazine as well as video games like Maximo: Ghosts to Glory and Motor Toon Grand Prix. Given the sparse in-game visuals, it really takes you back to the early days of gaming when you had to use your imagination to get the most out of the primitive graphics – that Level 46 Charizard might have looked a bit awkward and dorky on the Game Boy screen, but in your mind you knew that he was really the fearsome and mighty beast seen on the cover! The titular Tiny Barbarian needs no box art to make himself look fearsome and mighty however – just a simple press of Down and Y will make him bust out his best Schwarzenegger impression. While this pointless pose is no doubt the move in his repertoire that will see the most use (especially when fooling around in local co-op), you can also perform slightly less amazing actions like jumping and sword swinging. TinyB even has an epic elbow drop to dispatch enemies from above! It’s a shame then that despite the plucky personality of the protagonist, this is about as basic of a platformer as you can get. You run around, smack enemies, clamber up cliffs, collect a coin or two – the simplicity is reminiscent of the kind of Newgrounds Flash game you’d load up on your browser during middle school while the teacher wasn’t looking (which is no slight against Tiny Barbarian – those games are the only thing that got me through typing class). TinyB’s generous health bar and lenient checkpoints that always spawn you at the beginning of the latest screen usually keep the difficulty pretty manageable, and although each area introduces its own gimmicks and enemy types (vines, falling rocks, rotating platforms) the levels still manage to feel pretty samey overall. Thankfully the meandering platforming is sporadically broken up by exciting set pieces that prove to be the highlights of each 1-2 hour long episode. Navigating an auto-scrolling elevator, being chased by a boulder, traversing an airship, and climbing a pseudo 3D tower all provide far more entertainment and challenge than the bog-standard running and jumping. There are even a few Donkey Kong Country-style animal buddies scattered about for you to ride. It’s too bad that the game never seems to figure out that these moments are its strong suit – it’s like if Cuphead were all run and gun levels punctuated by the occasional boss battle instead of the other way around. Speaking of boss fights, they’re easily the lowlights of the game and feel totally at odds with the otherwise breezy pace. PC gaming site Rock, Paper, Shotgun recently posted a controversial article arguing that games should allow players to skip boss fights, and after slogging through Tiny Barbarian’s bosses I’m inclined to agree with them. Too many of its encounters are annoying exercises in RNG and tedium, forcing players to wait for opportune moments to whittle away at huge health bars. The worst example of this is the final boss of Episode 1, whose first phase has him teleporting around a series of rotating circular platforms that are usually too far away for you to reach before he teleports again, and has an even more egregious second phase where he simply cannot be hit during two of his three different attacks. There is one aspect where Tiny Barbarian unquestionably excels though, and that’s the soundtrack. Composer Jeff Ball brings his A-game to the compositions, and it’s a chiptune feast for the ears. Episode 2’s adventurous opening tune “Cliffside Morning Wood” was a quick favorite of mine with its punchy beat and SNES-esque instruments, as are the lawyer-friendly remixes of tunes from other games like Donkey Kong and Castlevania. The retro visuals are no slouch either, with clean and colorful pixel art that never tries to be too ambitious but gets the job done. Unfortunately we now come to Tiny Barbarian’s most fatal flaw: its not-so-tiny price tag. Quite frankly, $29.99 is a steep price for what’s on offer, even with the extra goodies that come with the physical edition. Despite sporting multiple episodes the entire adventure combined barely matches the content of a single Shovel Knight campaign, and for less than or equal to the price of Tiny Barbarian you could instead get another 2D platformer like Shantae: Half Genie Hero, Wonder Boy: The Dragon’s Trap, or Cave Story+, all of which offer far more bang for your buck and feel like unique experiences you couldn’t get with any other title. 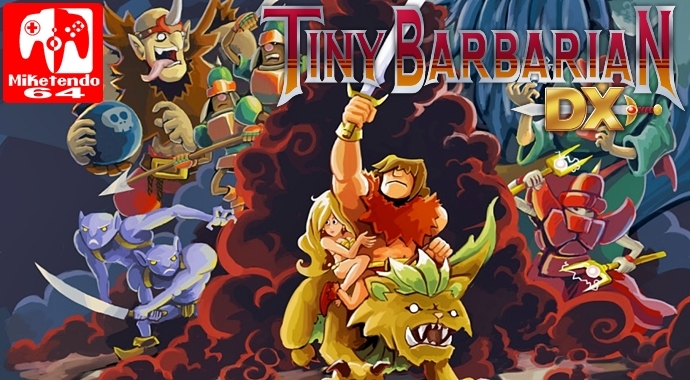 Tiny Barbarian DX is a tough one to review. I don’t want to give the impression that it’s a bad game, because it isn’t – it’s just that it’s hard to actively recommend because aside from the soundtrack, nothing really stands out. The level design isn’t particularly clever, the set pieces are too few and far between, and the boss battles are certainly nothing to write home about. It’s average, and when you’re up against much more ambitious offerings that are charging less, average just doesn’t cut it. Tiny Barbarian DX is a mildly fun 2D platforming romp, but in a world where there are so many more interesting 2D platformers on Switch vying for your attention, there’s not a whole lot of reason to choose this – especially at its $30 price tag.